As with most hobbies there is always a choice to build it yourself or buy a kit. We have books that will be very helpful to the self builders and we have some great kits for those that want to get on with the growing. 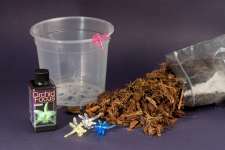 Modern growing kits are the product of decades of experimentation, refinement and improvement. There are kits for every purpose and to suit every available space. A versatile and fully automatic system that can be used in various ways, mainly as a system for intensive production of small plants - or as a watering system for plants in soil and soilless mixes. 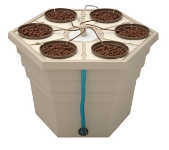 A complete automatic growing system. Based on commercial technology and scaled down for the hobby greenhouse. Will accommodate 20 plants - ideal for chillies, herbs and flowers. Everything needed to repot an orchid.